I resisted buying an iPad for a few months. Finally, I broke down and thought I had better check it out. At first, I couldn't see what improvement it made in my life. However, as I determined its uses and became more accustomed to it, I learned that it was invaluable. Its impact was great. I use it for reading - novels, newspapers, magazines; writing; watching videos and tv shows; games; and web surfing. It is so much more convenient than a laptop, and can do most of what I used a laptop for. Now, when I travel, I take the pad, not the computer. 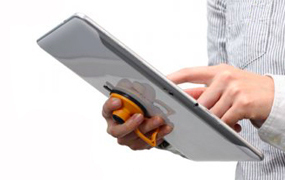 The pad is much lighter, has a longer battery life, gets through airport security more easily, and is easier to use on the plane. However, the hard edged body was a bit uncomfortable so I searched for a case. Found a simple soft plastic cover. 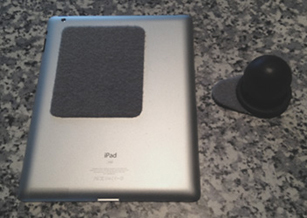 That was better, but it was still uncomfortable to hold the pad for long periods of time - like when reading in bed. Then I took a writing class and I needed a better angle for the screen keyboard. 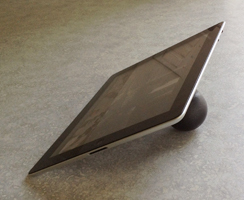 I already had some feet for the laptop, so I tried those on the pad. Not bad. But I still needed a larger handle for holding the pad. 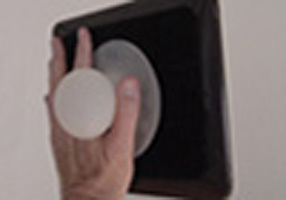 I had a knob that I bought at a museum shop during an exhibit of great product ideas from Droog. 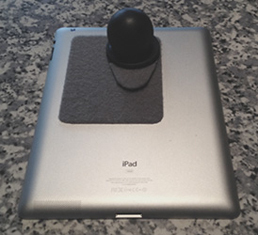 This knob worked perfectly - good fit in the hand and I could hold the pad for long periods of time by changing position of my hands in back. 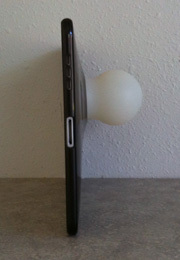 I then worked out some detail and developed the iGrip holding and support system. 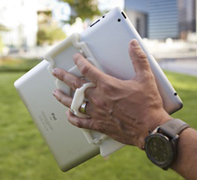 • Hold a tablet for more than 15 minutes at a time. 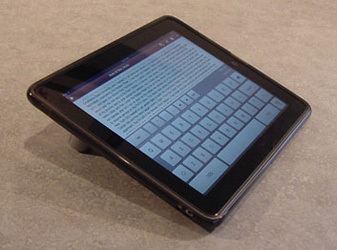 • Use a tablet e-reader in bed. System components: carrying bag, iPad case, knob grip, feet. 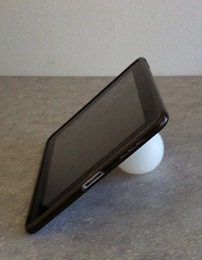 One foot can also attach to an iPhone for a better viewing angle. 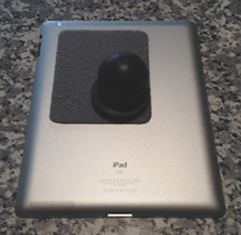 The knob used as a holder. 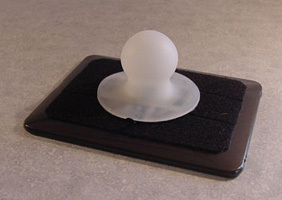 The velcro didn't adhere to the type of plastic that the grip ball was made of. So, to simplify the system, I cut a hole in the plastic case that secured the knob ball holder. 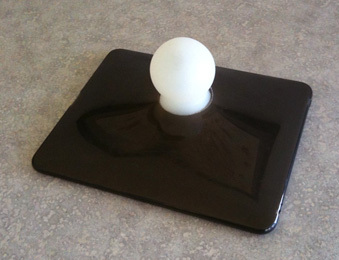 The ball is off-center to provide two different angles - one for typing and one for viewing videos. But, it didn't work on a desk in the portrait orientation. 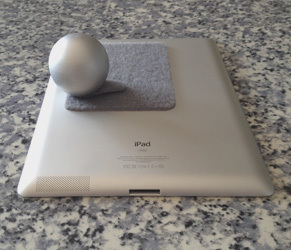 This version consists of just the case with the ball attached. I upgraded to the New iPad in March, 2012. It seems I've settled into a routine of upgrading phone and pad every 2 years. This allows me to jump every other upgrade model. 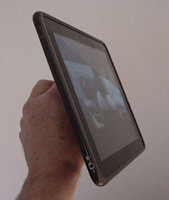 One of the changes between the original and iPad2 was a thinner profile and keener edge of the tablet. 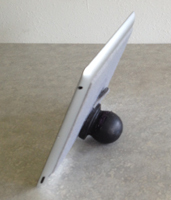 The tab at the base of the grips knobs provides a finger grip for easier removal. 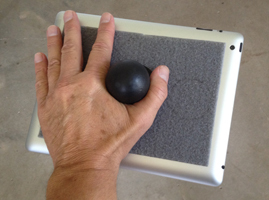 There are 2 sizes shown above, but prototype testing shows that the smaller is more comfortable in the hand and provides a better angle for typing. After using the iGrip for a while, I discovered that the knob needed to be closer to the edge when in the slant viewing position. Also, the entire back doesn't need to be covered - only enough for the knob to position itself along the two axes - portrait and landscape. 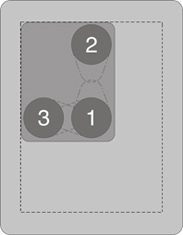 I realized that most people would place the knob in one of only three positions. I peeled off the velcro pad and adhered another one, this time with rounded corners. 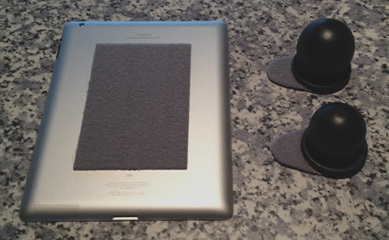 The pad needed to be large enough to provide adequate sticking surface on the back of the iPad. 1. Center for holding while reading and playing games. 2. Slant angle for typing or viewing in portrait orientation. 3. 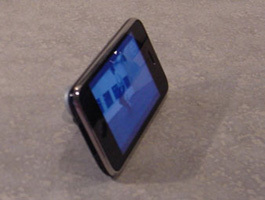 Slant angle for typing or viewing in landscape. 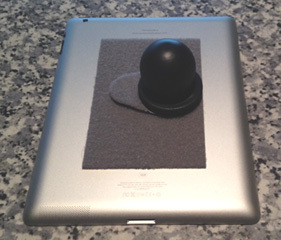 This wooden ball grip and velcro version works great - the best, yet. 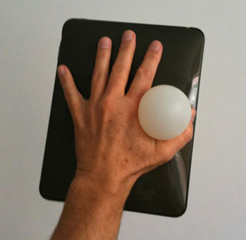 The size of the grip ball is very comfortable. The velcro is very sturdy. 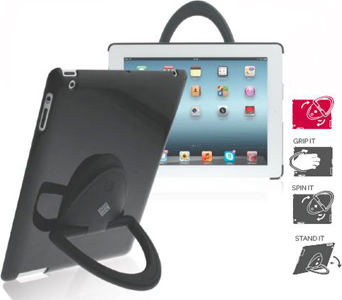 The iGrip solves the problems inherent in the iPad and provides a comfortable, versatile grip. 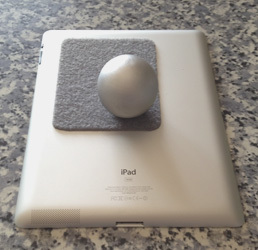 The disc base was a bit uncomfortable so I bought 2 more wooden balls and tried attaching the velcro to the base of the balls without the disc base. i also painted these chrome to better match the back of the pad. These were more comfortable, but there was not quite enough flat surface at the bottom of the ball to make a secure adhesion with the velcro pad. 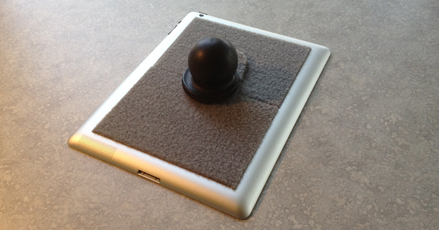 So, it was back to the ball with the base which provides a larger surface area for the velcro to grasp. I also tried a larger loop pad on the back of the iPad. 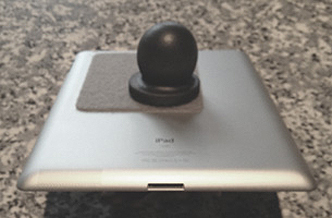 I use the iGrip quite often - at home and at Starbucks, Panera, airports, planes, etc. People notice the ball and I grasp it to show them how comfortable it is. After hearing repeated requests of, "I want one", I thought I had better look into marketing the iGrip. 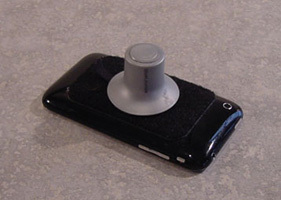 I originally called it the iBall, but discovered that was the name of a company in Japan that makes gadgets. iGrip is also being used, but I keep using that name just because it is so appropriate. My first step was to visit with an advisor at the Patent Repository at Oklahoma State University in Stillwater. The woman was very helpful and we conducted quite a search - finding nothing that was very close to my invention. 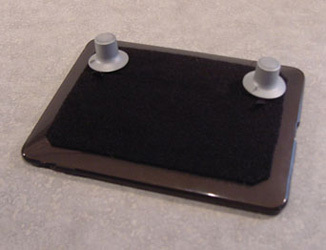 Months later, I met with a patent attorney, but I had waited so long that other products had come on the market, especially Add Grip (photo below). It was just too late for me to have a good chance at claiming ownership of the idea, getting a product to market, or licensing the idea. Oh, well. 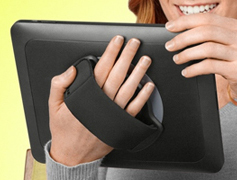 I still have a handy comfortable grip for my iPad. 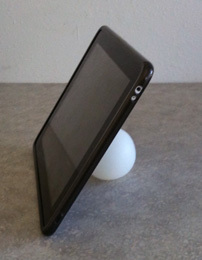 The variety and availability of these products confirms the consumer need for improved tablet holding methods.